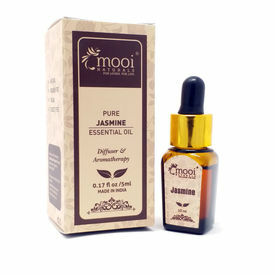 100% Pure,Steam distilled Jasmine Essential Oil extracted from the flowers of Jasminum Officinale. For Skin : Jasmine oil helps tone dry, greasy, irritated and sensitive skin for a ageless look. The heavenly fragrant oil increases elasticity,assists with stretch marks and reduces scarring. For Hair : The strong anti-septic oil helps get rid of dandruff,strengthens hair roots,makes hair less prone to breakage and gets a lustrous shine. On Mind: When used with diffuser, lends a sweet,exotic and sensuous aroma in the interiors that deeply relaxes,uplifts mind and boosts confidence. 1.Diffused Aromatically: Drop 5-8 drops in a diffuser burner or vaporizer gives off a pleasurable aroma creating a pleasant atmosphere. 2.Bath: Add few drops of this calming essential oil into the bathtub to get a relaxed and extraordinary bath experience.